Lauren Clem punts the ball downfield. The junior goalkeeper was busy against Michigan on Sunday, notching a career-high 11 saves. Last Sunday’s win over Michigan opened new doors for No. 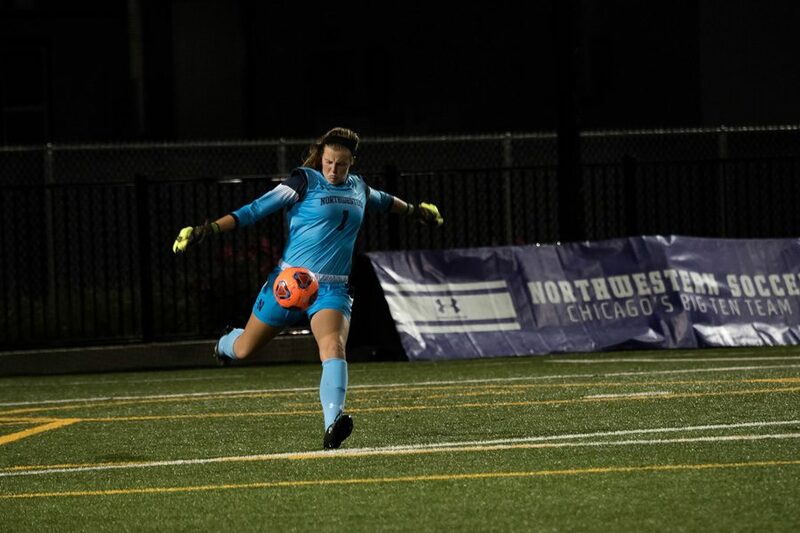 22 Northwestern, putting it a point behind first place in the Big Ten and making its goal of winning the conference’s regular season title feasible with four games remaining. But even with an easier matchup against Iowa (7-8-0, 1-6-0 Big Ten) awaiting them Thursday, the Wildcats (12-1-1, 5-1-1) are hesitant to think big-picture. NU’s strengths were evident against Michigan, where a career-high 11 saves from goalkeeper Lauren Clem anchored a defense that found its footing in the second half. The Cats’ scrappy style of offensive play helped produce a pair of goals from inside the box, with set pieces playing a big role in the 2-1 victory. Now, they’ll look to get their defense back on track for a full 90 minutes and to weather the loss of top-scorer Brenna Lovera to an ACL injury. Though Iowa is tied for last place in the Big Ten, its only conference losses by more than one goal have come against Ohio State, Penn State and Minnesota, teams in top half of the Big Ten standings. On top of that, the Cats lose home-field advantage as they prepare for a two-game away trip. Thus far this season, NU has gone 8-0-0 in Evanston and 4-1-1 on the road. As they search for a rhythm in preparation for the regular season’s home stretch, the Cats will also look to use each contest as a springboard to improve, all while balancing their long-term goals with the individual tasks ahead.